Asian greens offer a fascinating range of leaf shapes, textures and flavors. Enjoy smooth and creamy leaves from rosette-forming tatsoi or bok choy (also known as pak choi); the crunch of Chinese cabbage; or the narrow or deeply serrated leaves of mibuna and mizuna. And then there’s the intriguing range of spicy mustards: frilly, spoon-shaped, red-veined, red-leaved – even golden! Cool-season Asian greens are best sown in the last weeks of summer to grow on into autumn and beyond, making them ideal for following on from earlier crops. Sow direct into prepared ground, or start them off in plug trays to plant out a few weeks later. Most are pretty hardy and will continue to give some leaves for cutting throughout winter, especially if provided some protection in the form of a greenhouse or hoop house. 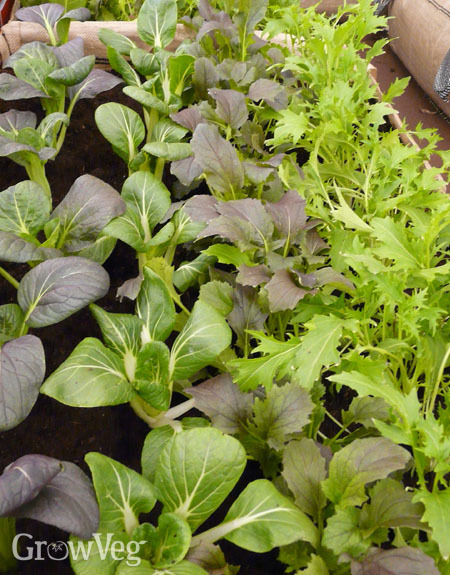 Asian greens grow well in pots, troughs and trays too, either as individual plants or sown as a mixture of different species and/or varieties to give a tasty explosion of flavors in one handy container. Most Asian greens are brassicas that often bolt, or flower, as days lengthen earlier on in the season. Sowing them from the second half of summer avoids this problem, and there are fewer pests such as flea beetle about too. If sowing earlier in the year, be prepared to pick the leaves very often to slow bolting, when plants push up flower stems and leaf production ceases. Plants grown in part-shaded locations are often slower to bolt, while sowing every few weeks should ensure a steady supply of usable leaves at this tricky time of year. Prepare soil for sowing or planting by sprinkling over a general-purpose organic fertilizer then raking it in to leave a fine, crumbly surface. To sow, mark out drills about half an inch (1cm) deep. Space rows six to ten inches, or (15-25cm) apart. Sow seeds thinly along the drills then cover back over. Water well if it’s dry. Once germinated, thin the seedlings in stages to their final spacings. For most plants that’s six to 12 inches (15-30cm) apart, depending on what you’re growing. Our Garden Planner includes helpful growing guides for each crop which include recommended spacings. And when you add them to your plan, plants are automatically spaced at the recommended distance, so you know exactly how much to grow in the space available to you. Sowing into plug trays before planting out has some advantages. You can start plants off while the final growing area is still occupied by another crop, and tender seedlings are at less risk of slug damage. Fill trays with all-purpose potting soil, firm it down with your fingertips then sow one or two seeds into each cell. Cover with more potting soil, water and place the tray somewhere bright to germinate. The seedlings are ready to plant out about a month later. Seed mixes, sown into their final containers for cut-and-come-again picking, should be scattered evenly onto potting soil before covering with more of the same. The seedlings shouldn’t need thinning. Plant plug-raised seedlings at their final spacings. Carefully remove plants from their plugs then lay them onto prepared ground. Use a dibber or similar to make the holes, then position and firm the plants into place. If it’s dry, be sure to thoroughly water after planting. Weed between plants to keep them free of competition – particularly important during the colder, darker months of the year. Slugs can be a nuisance, readily rasping holes into tender leaves. Pick them off at dusk or set up slug traps filled with beer and remove the slugs you trap. Protect plants grown earlier in the year from flea beetle by enclosing newly sown beds with row covers or insect mesh. You can hamper overwintering flea beetles by forking over the soil surface and clearing leaf litter from surrounding areas in early winter. Netting or mesh will also keep pigeons from pecking plants to pieces. In cooler regions, setting up a hoop house or cloche will improve growth rates as winter approaches, while a greenhouse almost guarantees harvests in all but the very coldest weeks of winter. Harvest plants like Chinese cabbage and bok choy whole by cutting through base of the plant. Loose, open plants such as mizuna should be harvested little and often, by taking a few leaves at a time from each plant. Pinch leaves off between finger and thumb, or use a pair of scissors. After each cutting there should still be enough leaves left for the plant to recover. Overwintered plants will grow strongly when warmth returns in spring, giving plentiful harvests before eventually bolting. When most plants are throwing in the towel for the season, you can always rely on the Asian greens for a final flourish. If you have experience of growing these loveable leaves, then please share your tips for success in the comments section below.